The other day I was thinking about the first recordings I'd ever made, at least that I could remember. The first recording device I had was a little Sharp cassette recorder I got for my birthday. I used to make recordings of myself playing the piano, or accompanying my mother singing. 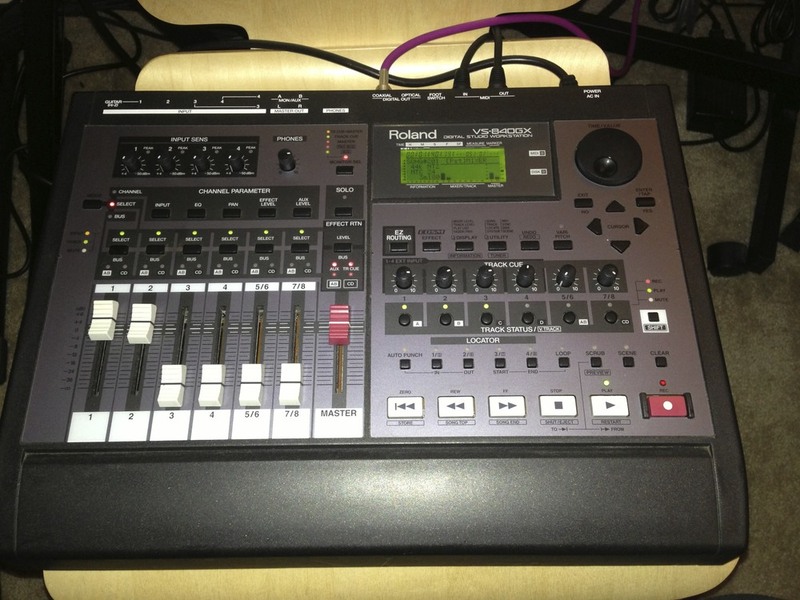 My first foray into multitrack recording came in the late 90's when I got a Roland VS-840 for Christmas one year. It was an 8-track all-in-one recorder with a mixer, ZIP drive to record onto, and built-in effects. I have that capability on my iPhone today, but back then that was the bees knees. Fast forward about 18 years. Numerous moves and relocations later, I still have some boxes left over in the closets that traveled with me from apartment to apartment. As it turns out, in one box I found a whole bunch of those pesky ZIP disks. A quick Google search found no computer software able to read VS-formatted disks (nothing for Mac, at least.) so I figured I ought to see if just maybe I could grab an old VS-840 on eBay for not too much...and I did. About $130 and a week later, we fast forward to tonight. I've just spent the last two hours reliving some of the best memories I'd had getting started in my studio life. I found recordings I'd thought I'd lost, that now through the miracle of new studio technology I can fix them up and share them with the people on them who may have long since forgotten about them. It's amazing to listen to past projects, to hear where you came from and then compare them to where you're at today. Every bit of time spent in the studio is valuable experience to get you ready for the next gig. My little nugget of wisdom for you is this: If you don't already have one, put together a master archive of all of your past projects. Try to get anything you've recorded, no matter how insignificant or trivial. Put these all in the same place, whether it's a playlist in iTunes or a folder on your Desktop. Visit it every now and then, update it with what you work on. It lets you learn from your experiences and reflect on things you did well, and could have done better, but more importantly it lets you relive moments from your past in which you were doing what you love: Making music. The VS-840GX from eBay...aka my "Time Machine".